This article was published in the April 2009 issue of php|architect. Multilingual applications use two types of texts requiring translation. The first ones are messages without a relation to the data (for example the title "Contents") which can easily be translated by GNU gettext or by a simple database table. The second type are texts related to the data (for example a German and Italian title for the same product with a given price). This article will examine database strategies for this second type of text. 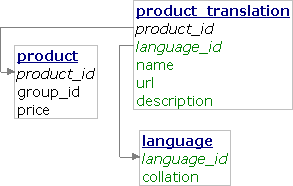 Multilingual applications should use simple SQL queries (to avoid bugs), keep the performance high (which mainly means to utilize indexes) and produce the exact output (sort according to each language collation and respect the fulltext threshold). In additionally database consistency should be maintained, for example to preserve uniqueness of URLs. This article compares three different approaches for storing multilingual records considering these goals. In addition, the complexity of adding a new language and working with untranslated texts are covered. Because of filesort, MySQL has to read all entries and cannot use the LIMIT clause to skip unnecessary rows. It is N * log N where as to perform the ordering with LIMIT clause would be a constant! MySQL cannost use the index on (language_id, name) for sorting at all because we need a different collation for every language. What about fulltext search? MySQL natural language search ignores words occurring in at least half of the rows. Because all languages are mixed in one column, this feature will likely exclude most words and thus be useless. Fulltext search can be good in some scenarios but it has negative impact on performance. Moreover, MySQL cannot use a fulltext index together with a normal index so the fulltext must search in all languages and then restrict the results by hand. One option is to copy the default language version of all texts to the newly added language. This greatly complicates adding a new language to the application. It also complicates adding a new product. Unique index above URL would work but then we would have to insert all translations in a transaction and rollback the transaction in a case of conflict. Unique index above URL is useless as we would have to check for existence of the same URL in a trigger or a stored procedure at the time of inserting, updating and deleting a product translation. This approach copies also the data common to all languages. The group identifier and the price are copied to all languages. Technically a trigger can achieve it, however we have to define a trigger on all translatable tables in the database and it has to respect all columns in the table (so addition or modification of a table would be difficult). The data also takes more space so the working set is less likely to fit in memory. The COLLATE is causing a filesort which is bad for the LIMIT clause. The query would be fast without it but the results would not respect the sorting order specific for the language. Both problems with fulltext search remain. We have to solve the same dilemma as in the previous approach regarding untranslated texts and adding a new language. Either the queries will be complicated and slower or the language addition will be painful. Unique index would not work in the case of falling back to the default language or we would have to do all modifications in a transaction when copying the default language. Each translatable field gets its own column in each language. The same holds for indexes - there are more of them but they are smaller. Both problems with fulltext search disappear. Each index has separate statistics and there is no need to filter by language identifier when performing the search. Adding a language definitely will be a difficult operation so we do not need to solve the dilemma whether to store the default language to untranslated texts. It can be stored to keep query simplicity and speed. Unique indexes above URLs simply work. The maximum row size in MySQL is about 64 KB so with big tables and many languages, this limit could be reached. In this case, it is possible to separate some columns to a different table with one-to-one relationship. Another approach would be to store each language in a separate table and copy common columns the same way as we did in the Data copy approach. This however involves problems with trigger maintenance. 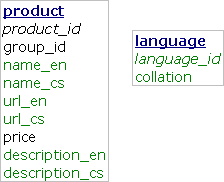 Other database systems such as Oracle or PostgreSQL do not have support for a collation definition in each column and use a different approach for a language-dependent sorting. They define (PostgreSQL through an extension) an nlssort function accepting a string to sort and a language identifier to sort by. 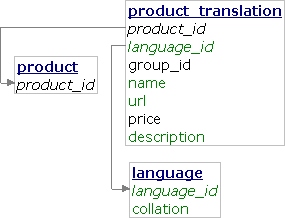 The database systems can use this function together with partial function indexes to sort the products effectively in the Data copy schema. However, we still have to define the indexes at the time of adding a language. For messages with no relation to the data (mentioned in the beginning of this article) we can use the same database schema to store translations. This way we can use the same infrastructure for translating both kinds of texts. Translators need a list of texts required for translation. We cannot generate this list by comparing messages that are the same as the default language because some translations are simply the same as original. We can maintain this list in a separate table. In the ideal world, all the translations would be stored in a single cell with complex data type. This data type would know how to sort the data in each language and how to use them in index. It would also know how to handle untranslated texts. However, we have to split the cell to either rows or columns in the world of relational databases. The third approach has a big handicap in the variable database structure (the user adding a language must have the ALTER privilege). It exceeds the other approaches in all other aspects and at the end of a day, we have to do the least work and still get a solution with the highest performance. 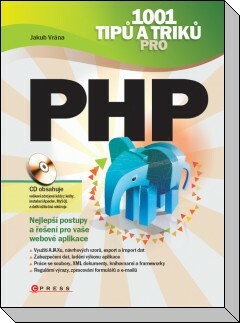 Jakub Vrána is one of the authors of official PHP manual, and he uses MySQL for developing web applications in PHP. He also teaches the MySQL basics at Charles University and conducts commercial trainings. He is the founder of compact MySQL management tool phpMinAdmin Adminer. Jakub lives in Prague, Czech Republic. Ano, to je jednodušší článek na stejné téma. Kompletní překlad tohoto článku psát nebudu. Díky za upozornění. Ale jde o přetisk článku z php|architecta, takže v něm výjimečně změny dělat nebudu. Chybí mi tu čtvrtá možnost - samostatná tabulka pro každý jazyk překladu. Nevýhodou je sice proměnný počet tabulek, ale zase by se mělo značně vylepšit řazení. Dobrý článek. Díky, že ses o něj podělil. Korektury si v php|architectu naštěstí dělali sami, článek byl celý červený :-). Sem jsem ale asi dal verzi bez korektur, protože se mi je nechtělo přenášet z jejich formátu do HTML. Ten limit 64 KB na řádku, ten platí pro součet všech sloupců kromě typů text a blob? Ano a je to skutečně bajtů (nikoliv znaků). Takže např. pro varchar(100) v kódování UTF-8 vyhradí MySQL 300 bajtů. Typy text a blob zabírají nějaké místo na pointery. InnoDB má navíc ještě vlastní limit, který je jen 8 KiB. Time for you to edit "He is the founder of compact MySQL management tool phpMinAdmin" and say adminer.